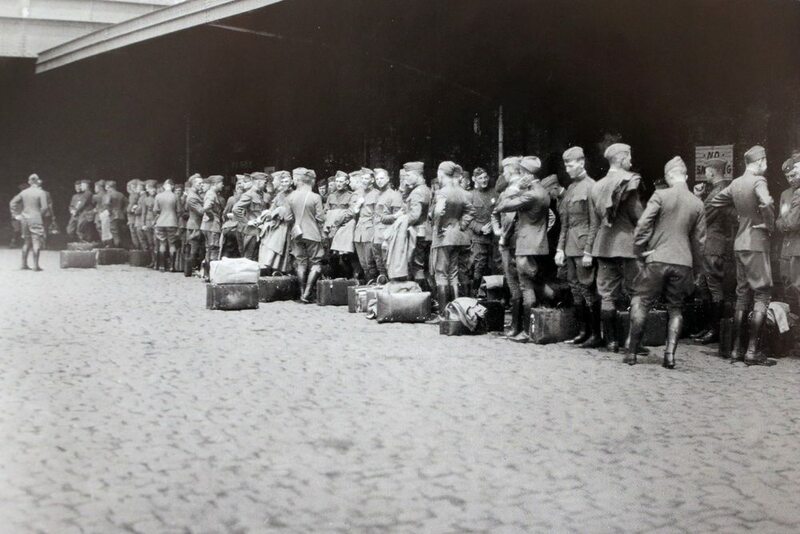 West Point cadets departing in June 1919 for summer study on European battlefields. Unfortunately, we can see the same complacency today. The New York Times recently described an analysis of campaign advertisements from July 2014. Of the 1,155 ads, only 49, or about 4%, were about any subject even remotely resembling foreign policy. Despite all that is happening in Iraq and Syria, Ukraine, and in Gaza – on some broad level – what happens beyond the water’s edge is for someone else to care about. Thankfully, anyone reading this essay is cut from a slightly different bolt of cloth. There’s interest in what goes on overseas, or, in seeing the world as it is. Any reader on War Council is naturally inclined to study the use of force, particularly warm and hot battlefields. Like storm chasers, often, the closer you get the better you’ll understand the wind patterns and trends. However, if you can’t get to the precise center (or vortex), what follows are some things I think you might deem important to consider in your observations of Iraq (and Syria/ISIS), Ukraine, and Gaza from afar – so you can better understand the environment we live (and may fight) in. With respect to Iraq, did the U.S. “win” or “lose” there? Does that even matter? Consider the complexity, the many sides, which I’ve referred to previously as a Rubik’s cube war. ISIS defies definition. I’ve heard former CIA Deputy Director Mike Morrell refer to the group as a “terrorist army,” typically a contradiction in terms. 1. If the enemy moves in open terrain; no cover or concealment (i.e. desert). 2. If the enemy has no air force or useful anti-aircraft weapons to speak of. Reasonable military judgment would conclude from this basic analysis that we cannot compel ISIS to victory through airpower as they will (for now) be able to take shelter in cities like Mosul. They can still find sanctuary through the cover that cities and populations provide. However, airpower can deny them open traffickability and supply routes in between the cities they hold – and that’s very valuable. That forces adaptation in their behavior. In car racing, there’s an old adage that “you win in the turns.” Similarly we might be able to break something loose if ISIS handles this strategic adjustment poorly. The conventional wisdom assumes that we won’t fight Russia openly, which begs the question: how do we counter Putin? Considering the U.S. Army’s Regionally Aligned Forces construct, one can envision a training role; preventing an expansion of the conflict, shaping it, if not directly fighting and winning it. In this way, the U.S. Army may yet participate indirectly. This is still land power, just the quieter side. An example would be increasing training with the Poles, or, as I did last year, the Latvians. This statement presumes the market will stop Putin. That today, and in the future, the capitalism will constrain the use of force. Though I can certainly agree the market matters, it certainly won’t deter aggression on it’s own. All that said, this broad “utility of force” discussion isn’t what I think is most interesting with respect to Ukraine. In many ways, I think Putin is teaching us the nature of landpower in modern war. He’s exploiting shades of gray by maintaining some semblance of deniability – think of the “little green men” that showed up in Crimea. The ones with the giant beards – however, other than the powerful beards – this is not 19th century warfare. Look to just one trend: Ten percent of the all the pictures taken in world history by 2011 were taken in 2011. Everyone has a phone, so everyone has a camera, so everyone can be a war correspondent. Instead of wars coming into living rooms, they’re available at the world’s fingertips. So when conflict is fought, to update General Sir Rupert Smith, today, “war is amongst all the people.” No matter what lengths the Russians go to, if they want to exercise landpower, the world can see their footprint (as I’ve pointed out before). Putin and the Russian army know this and are clearly mindful of this nuanced environment – they’ve taken steps to minimize their liability. That’s a 21st century approach to landpower. 1. A shift from tunnels as strategic lines of communication/operational support to the use of tunnels as tactical geography. This creates a “360 degree front.” For example, Israeli soldiers have reported Hamas gunmen firing from one house – and minutes later popping up across the street at another house. 2. There is still no technological solution to subterranean warfare. Just as at Petersburg in the American Civil War, the only solution is a sharp shovel and a determined will. This kidnapping incident suggests that soldiers have the potential to matter today as a symbol beyond their individual battlefield value. This is particularly true with respect to Israel, as they traded literally over 1,000 imprisoned Palestinians for their last captive soldier (Sergeant Gilad Shalit). This strategic cost is so high that the Israelis have developed what they call the “Hannibal procedure,” named for the Carthaginian general who preferred death to capture. As retired Israeli army general Yaakov Amidror described, “you have to do all you can, including risking – not killing – the soldier.” As an example, Amidror offered that an Israeli soldier might fire a tank’s main gun round at the engine of a car driving away with an abducted Israeli soldier. What a predicament to be in – imagine you were the adjacent platoon leader to Second Lieutenant Goldin in the moments after he was taken – what would you do? There really is no easy answer to this question, or the others I’ve raised in this essay. For military professionals that ought to provide fuel to continue to study, to reflect, to learn as much as possible before these questions are within max effective range on some foreign battlefield. Before wrapping up this tour of the devastating conflicts that have ripped across the summer of 2014, it seems appropriate to reflect on some connections. For Iraq, Ukraine, and Gaza in 2014 – the dominant thread amongst the three appears to be the role of information in warfare. Whether it is an ISIS recruiting/publicity video, Russian attempts to stay off camera, or the nightly news (in the USA) depicting the massive casualty imbalance in Gaza (not to mention the music video battle between Hamas and the Israelis) – the information component to war seems to have gained greater traction. Which is not to say that the internet and television is guiding world opinion; as described at the outset of this essay, the American public appears to care not at all about these three wars. This incongruity merits further attention. The information component trend in warfare is scary, however, due to what I know is an American lack of preparedness. Despite the characteristics mentioned above and Osama Bin Laden‘s estimate in 2002 that the media makes up 90% of his war effort (Zawahiri thought just over half; must’ve been lowballing), at West Point, cadets receive precisely one hour of “digital decorum” in their four years of professional military education. This single hour is geared towards avoiding distribution of inappropriate PowerPoint presentations and Yikking and/or Yakking. This 60-minutes of education may be a laudable pursuit, but hardly useful on the modern battlefield. This amounts to sending our new officers into a gunfight armed with a spoon. Nearly none of the military professionals in Europe had done any thinking about when they would be on the other side of the machine gun (not to mention when someone set up barbed wire obstacles). When this failure to learn happens, it becomes painfully clear who pays the experiential cost – junior officers and enlisted soldiers. Humanity makes them mortal; the profession makes them expendable. This is certainly unfair as they are so young, but, if nothing else, should reinforce the importance of studying war, both historical and contemporary. There is one silver lining to this cloud. It has been done successfully at least once before. The image at the beginning of this essay is from June 1919 – newly commissioned second lieutenants from West Point departing for a multiple-month tour of still-warm European battlefields. They studied, they learned the lessons on offer from the wars of their times – and put them to use in the next great conflagration. We should follow the example they set. NextEbola and West Point: What is the role of land power in outbreaks?